Schade received his MA from the University at Albany and an MFA from Cranbrook Academy of Art. An internationally acclaimed printmaker, bookmaker, and illustrator, he also served as Professor of Fine Arts for The Sage Colleges. The artwork of William B. Schade is unusual and whimsical, often reflecting his sense of humor and imaginative approach to creating. Schade’s body of work is almost exclusively animal focused. Typically the creatures are employed as characters of storytelling. 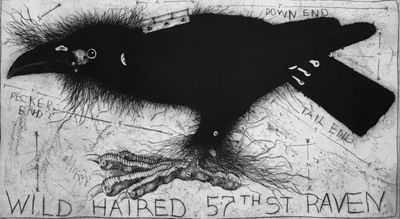 The raven in Wild Haired 57thSt. Raven appears to be part of a plan – hinges and screws have become part of the bird, as if it must somehow undergo adaptations or be fixed, perhaps in order to survive.